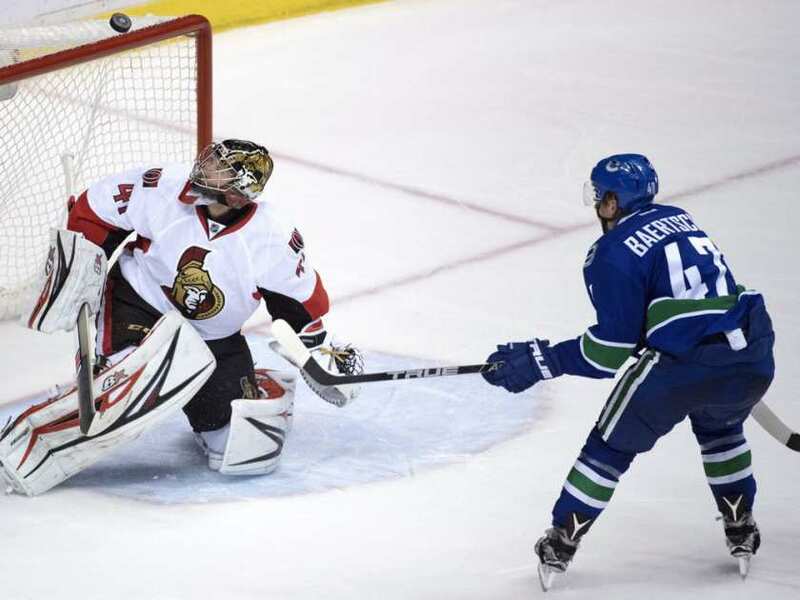 VANCOUVER — Craig Anderson made 22 saves and Ryan Dzingel scored twice to help the Ottawa Senators to a 3-0 win against the Vancouver Canucks at Rogers Arena on Tuesday. It was the first shutout this season for Anderson, who won three of his first four starts despite allowing 15 goals. He faced three shots in the third period but stopped Sven Baertschi on a breakaway with 5:45 left to preserve his 34th career shutout. “The way we played defensively allowed me to only have to make one or two big saves and when that is the case, usually you can have a pretty good game,” Anderson said. Dzingel was promoted from the fourth line to play on the left wing with Derick Brassard and Bobby Ryan. Jean-Gabriel Pageau scored an empty-net goal with 2:19 remaining for the Senators (4-2-0), who changed all four lines after a 4-1 loss to the Tampa Bay Lightning on Saturday. Dzingel, who had two goals and two assists his first five games this season, made it 1-0 7:38 into the first period on a 2-on-2 rush. Dzingel worked a give-and-go with Brassard, then drove to the net to chip the rebound of Brassard’s low shot from the right faceoff dot over Ryan Miller‘s glove. Vancouver (4-2-1) trailed going into the third period for the sixth time in seven games this season but had managed to tie the game in the previous five. But Dzingel scored again after a nice cross-crease pass by Ryan at 2:12. “I don’t know if we thought it was going to happen in the third because it had happened in the past, but we didn’t get off to a good start,” Canucks coach Willie Desjardins said. Miller pushed off his post and threw out his glove to rob Mike Hoffman on a one-timer from the slot after a nice pass from behind the net by Mark Stone 57 seconds into the third period. Anderson faced three shots in the third period but closed the five-hole against Baertschi on a breakaway it keep it 2-0. “When you are called upon to make a big save you need to be there, and that was kind of the icing on the cake … the nail in the coffin,” Anderson said. Anderson kicked the toe of his left pad out just in time to rob Markus Granlund on a far-side one-timer from the left circle after a nice pass from behind the net by Brandon Sutter to keep the Senators ahead 1-0 with six minutes left in the second period. Canucks rookie defenseman Troy Stetcher made his NHL debut on the top pairing with Alexander Edler in place of Christopher Tanev, who is day-to-day because of a lower-body injury. … Forward Jayson Megna made his Canucks debut after Derek Dorsett (shoulder) and Alexandre Burrows (neck) were injured over the weekend. They are expected to miss 7-10 days. Senators: At the Calgary Flames on Friday (9 p.m. ET; SNF, RDS2, TSN5, NHL.TV). Canucks: Home against the Edmonton Oilers on Friday (10 p.m. ET; SN360, SN1, NHL.TV).